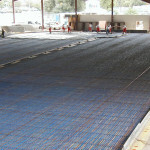 Ice surface pad – horizontal subsoil compaction and marking of vertical boundaries with multilayer boards, all components for digital measurements including heated ice pad, thermal insulation, waterproofing, reinforcing pad, rink cooling pipes, reinforced concrete pad, ice surface paint, heating and cooling media distribution and collection mains from the chiller plant. Ice surface cooling equipment – ice surface cooling and base heating, heating and cooling generated by a heat pump and a bivalent (auxiliary) electric boiler. 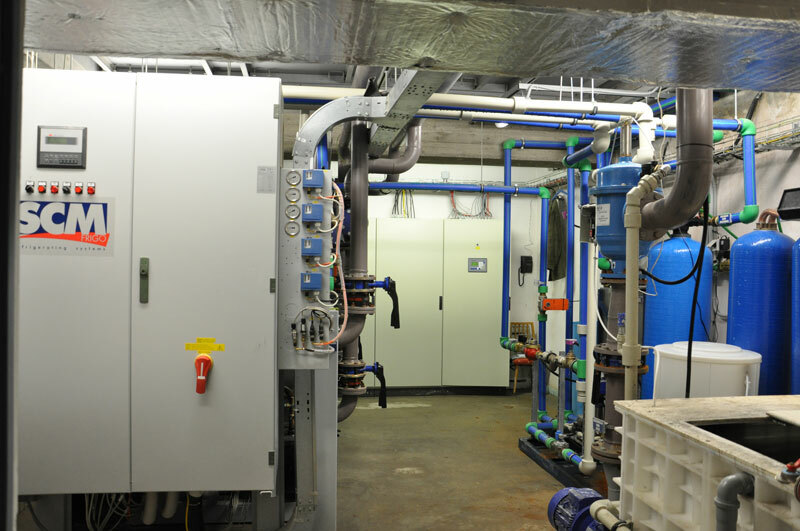 Equipment for heating and treating water for the ice resurfacer, water treatment for melting pit (recycling system). 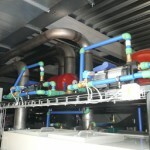 A heat pump using waste heat from the cooling system serves as the primary source of heat. Measurement and controls – BMS – independent measurement and controls, automated control over all installed systems and technologies, uniform visualization of instrumentation panel and distribution lines + software licenses + programming work + installation, commissioning and training. 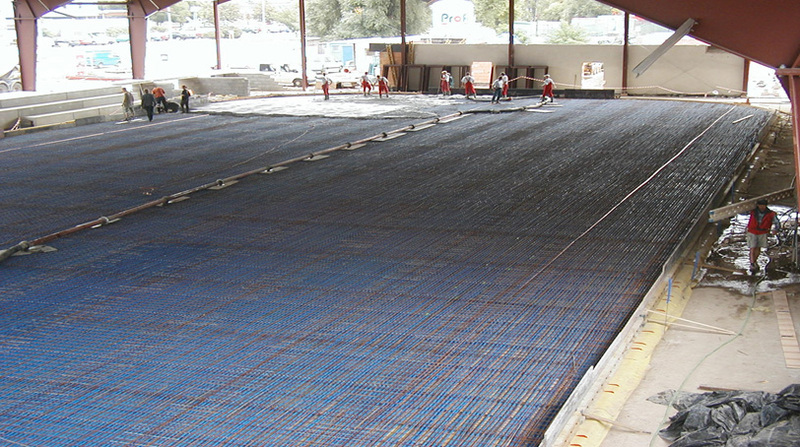 Generally this heat load is covered only by the cooling provided to the ice surface’s concrete pad. Use of frequency drives on all important motors – fans on the adiabatic dry coolers, ice surface circulation pumps, etc. 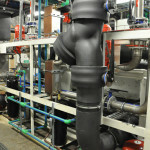 “Waste” heat from the chillers is the primary source of heat. 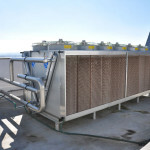 A heat pump is used to increase the level of such heat as waste heat itself is difficult to use for building technical equipment purposes without modification. 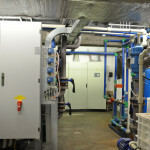 The size of such heat pump is selected based on the heating demands of the specific building. Downstream from the heat pump is the building manifold for heating water, reheating hot water and reheating the water for the ice resurfacer. 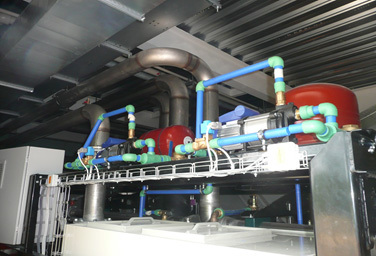 The BMS system ensures that the heat pump operates at maximum efficiency in conjunction with the chiller. If there is demand for heat and no demand for cooling, the heat pump will use the air-liquid dry cooler. In this mode the thermal pump has a lower heating factor. A bivalent (auxiliary) heating source is installed to ensure 100 % system functionality and such source may be an electric boiler, a gas boiler or a heat exchanger station. The primary chiller is the source of cooling. 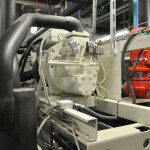 A branch is installed on the return line from the ice surface and a mixing valve is installed to adjust the cooling liquid to the required value. A “cooling storage tank” is installed if the building is larger and cooling is needed to cover heat gains. Such tank is able to take advantage of the physical stage transformation of the working media to “store” energy and later release this energy to individual devices as needed. A unified SIMATIC control system is installed to manage the operation of technical cooling, HVAC and heating systems. All of these technologies controlled by the system communicate using the common PROFINET bus and are controlled and visualized on the dispatch PC station to the operator. All control algorithms for the equipment are interconnected as the fundamental control variable is the operation of the ice surface. All control over equipment operation (ice temperature settings, space temperature set points, humidity, operating modes, signalization of operating conditions and failures, etc.) is conducted exclusively using the operator’s PC station located in the control room. This dispatch PC station has remote access capability to allow a maintenance organization to conduct diagnostics and resolve failures while optimizing the energy use of technical units. The basis for efficient and functional completion of the project is high quality project documentation for all trades and their coordination. Our firm is ready to provide complete project documentation. Thanks to extensive experience with ice rink projects and construction we are able to ensure the functionality of the entire system while also estimating operating costs to a high degree of accuracy. These required values cannot be ensured without controlling the flow of outdoor air inside the ice rink and its dehumidification. PRINCIPLE: outdoor air should not penetrate into the interior spaces of the ice rink. Warm and humid outdoor air places an energy load on the cooling and dehumidification equipment. The use of equipment to produce and maintain the ice as the source of heating and cooling and for operating the HVAC equipment is the best solution in terms of operating and investment costs. Use of waste heat from dehumidification for subsequent heating in the ice rink: for heating technical hot water, water for the ice resurfacer and heating ice rink areas. Unbalanced demand for heating and cooling are generated depending on the operating periods of an ice rink. In order to use the waste heat from the chillers a component to store such heating and cooling must be inserted into the system. A conventional solution is to install two tanks for storing heating and cooling. This solution requires a tremendous amount of space and is insufficient in terms of the small ratio between the volume of the tank and the stored heating or cooling in such tank. If a suitable source of cooling is used to produce and maintain ice then a phase change storage tank for heating and cooling can be used. A phase change tank is a device in which the phase or state of water is changed to ice or vice versa, leading to a charging and storage of cooling and providing a source of waste heat and conversely the storage of heating when charging. As a source of cooling for condensation dehumidification. The discharge of the tank again accumulates heat that can be used regardless of the status of the ice surface cooling system during the repeated charging of the phase change tank. 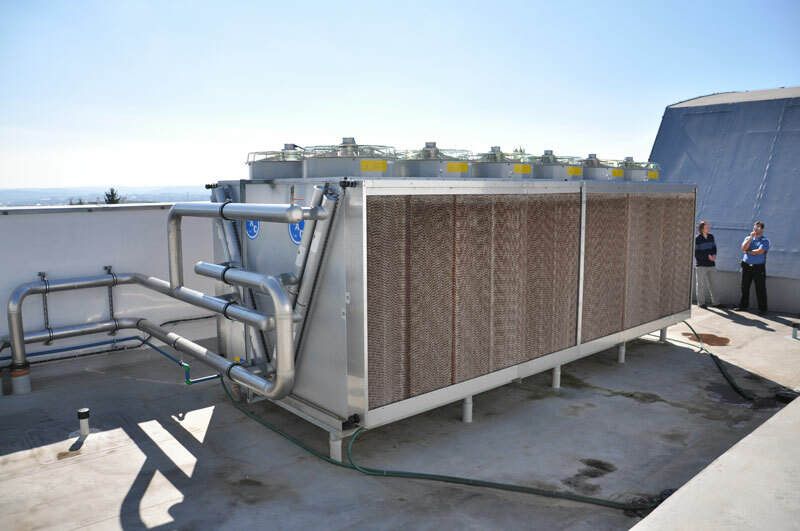 Given the method defined for storing heating and cooling, the chiller essentially becomes a heat pump that supplies the full delivery of heat for stadium facilities depending on demand. The chiller operates with ecological R 134 A refrigerant to achieve high energy efficiency in a broad range of operating modes and temperatures. A major portion of the ice surface load is the resurfacing completed at least 12 times a day by the ice resurfacer. Essentially around 57 kWh of cooling is removed from the ice surface during a single resurfacing, having been transformed into ice shavings and the resurfaced ice surface is also subjected to the load of the hot water applied to the surface by the ice resurfacer. A properly configured system for melting ice shavings in the melting pit can deliver ice water with a temperature of around +3 °C. This ice water can be used to decrease the energy in the liquid refrigerant before it enters the evaporator with a suitably installed heat exchanger. This results in recuperative cooling. The heated water from the heat exchanger with a temperature of +25 °C is sprayed on the ice shavings to melt them. Melting the ice shavings using the previous method produces water that can be reused to resurface the ice surface after it is treated to remove contaminants and is reheated. The water is filtered in a cascade system of network filters. 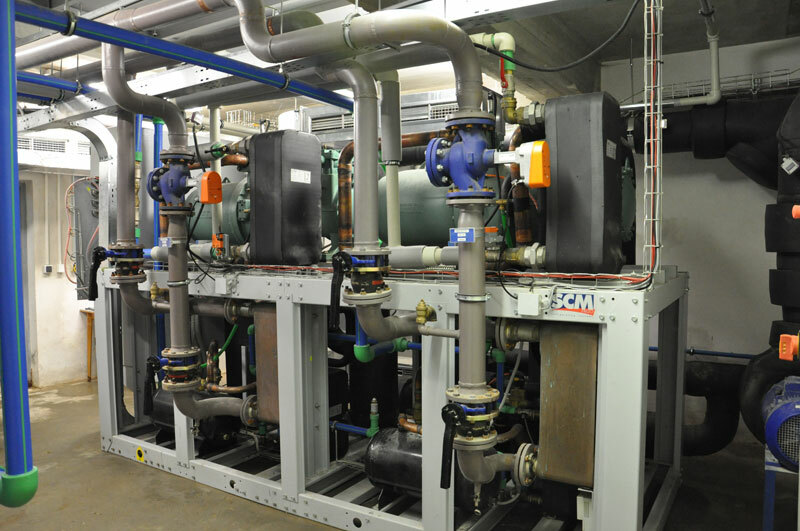 After filtering the water is heated in a heat exchanger to a temperature of 35 °C using waste heat from the chiller and then supplied directly to the ice resurfacer. The ice resurfacer is filled using a programmable water meter that supplies the defined amount of water to the ice resurfacer automatically by simply pressing a button. This method saves around 10 cubic meters of water a day, or around €20 per day per ice sheet. Free of any solids causing clouding. In general the ideal water for making ice is distilled water as it freezes easily. However, given the mechanical load on the ice surface, ice made from distilled water is unsuitable given its tendency to fracture at temperatures below -5 °C. The number of crystal cores in the water is critical for ensuring ice strength and toughness. The crystallization core is the sold, microscopic particle (impurity) from which the crystal of ice begins to form. The larger the number of crystal cores in the water, the greater the number of small crystals with larger mutual bonding force that are formed. This means that the ice will be stronger and not have the tendency to crack. The basic question when selecting a cooling technology basically comes down to choosing ammonia or not. Given the complexity of operating ice rinks, this is an important question but not the only question. Ice rink operating costs are more than payments for electricity; rather they involve heat, water and other overheads. This relationship means that a targeted reduction in costs of a single item, e.g. 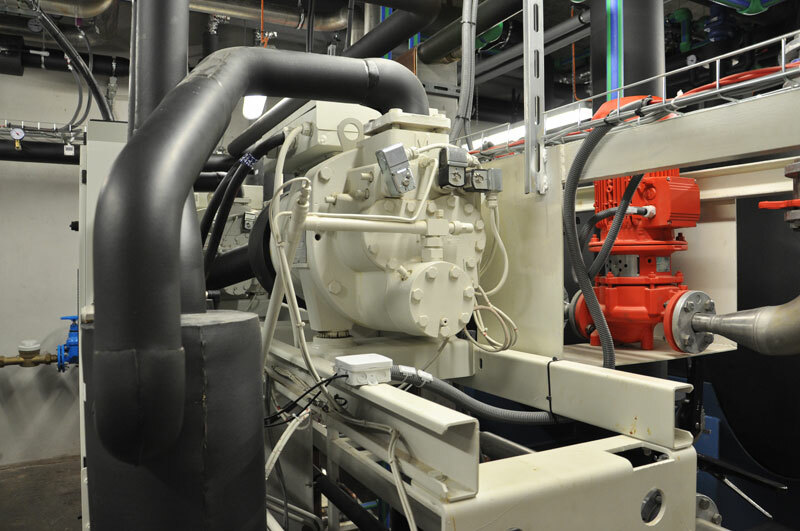 electricity used by the cooling plant without any real use of waste heat, also drives an increase in costs for heat and water. 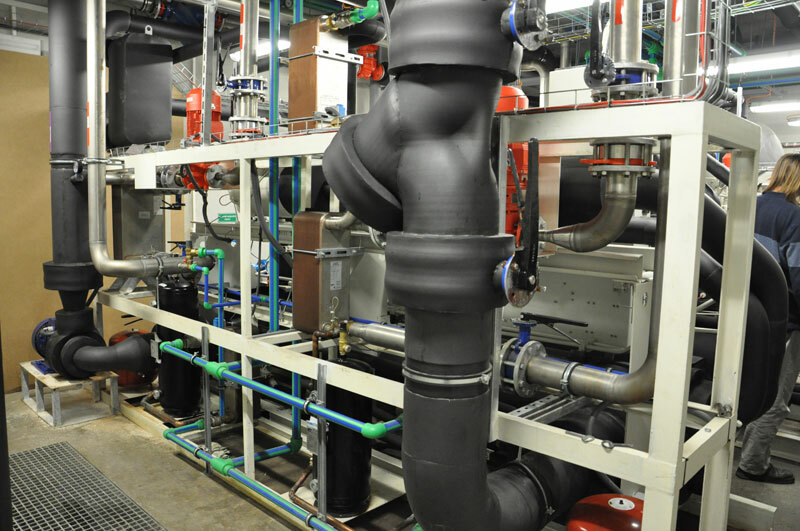 This system is focused on maximizing the use of waste heat to cover all the heating needs of the ice rink. This is the basic difference: either some or all the waste heat available is used. Emphasis in the design of the system is placed on using up to 100 % of the available waste heat. As evidence of the effectiveness of this concept a real comparison of two identical ice rinks with different philosophies applied to technical aspects is presented below. The ICE Arena in the Letňany district in Prague (2 ice surfaces) uses direct ammonia cooling, with heat supplied from the urban distribution network and water from a separate well; this rink has higher operating costs than the identically operated Hockey Hall in Brno (2 ice surfaces) which has the indirect cooling system as identified above without the use of ammonia. These facts can be verified with both operators and the operator of ICE Arena in Prague has requested that our company make modifications to decrease the overall operating demands of the facility. Another essential fact in this case is the assessment completed by an independent academic authority, prof. Petrák from Czech Technical University in Prague and its Department of Energy Engineering, who assessed the specific design of the system based on the principles described above and compared it to an ammonia system. Given the general contemporary tendency to limit their use for political reasons (global warming), common synthetic refrigerants have been subjected to various inaccurate claims made by various interest groups with respect to a potential ban on such refrigerants. 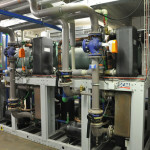 These refrigerants will continue to be used for their undisputed technical and operating advantages and any attempts to restrict their use will ultimately result in the development of new refrigerants to curb their use without the need to replace entire chiller or refrigerant units.